There is a certain elegance to taking photographs using a wireless option (or a wired option for that matter), even if you’re standing next to the camera—it affords you the ability to connect with your subjects on a more intimate level, as the camera is no longer a barrier between photographer and subject. Q. How many different ways can you “click” the shutter of your DSLR or Mirrorless Camera? Use a cable release or remote cord such as the 10-pin connector type MC-30/MC-30A or MC-36/MC-36A; or the MC-DC2 remote cord, which utilizes the accessory terminal on select cameras. This tethers you to the camera, but, depending upon the length of the cord, you can be anywhere from 1 - 12 feet from the camera when you take the shot. Go completely wireless, using the WU-1a or WU-1b Wireless Mobile Adapter to trigger the shutter from your compatible smartphone or tablet. Or for cameras with built-in Wi-Fi, simply turn it on and use the WMU or SnapBridge app (depending upon the camera model) on your compatible smartphone or tablet. For select cameras that are compatible with the WT-4A, WT-5A, WT-6A or the WT-7A wireless transmitters or the WT-5A wireless transmitter + UT-1 communications unit/UT-1 communications unit), you could shoot and send images to a computer or FTP server via Wi-Fi® or a wired Ethernet connection respectively. Depending upon your camera, remotely control the camera from a computer running Camera Control Pro 2 software; or shoot and send images from your DSLR or Mirrorless camera to a computer or FTP server. So, as you can see, there certainly are a myriad of ways to trip the shutter on your camera to take a photograph, however some are more ideally suited to specific shooting situations than others. Lets look at the different situations you might find yourself shooting in and the best solution for each. Want to take a photograph of a bunch of friends—and get in the shot too? Well, you’ve got a few choices. Set the camera on a tripod, frame up the shot and set the self-timer. Then you just have to quickly get into place before the self-timer trips the shutter. If running into the scene isn’t for you, don’t worry; you’ve got plenty of other choices. Odds are, if you could have run quick enough to get into the scene by the time the self-timer went off, then the camera is in direct line of sight of your subjects. In this case, you can use either the ML-L3 or ML-3 remotes, which use Infrared (line of sight) to trigger the camera. The range on the ML-L3 is 16 feet from remote to camera, and the range on the ML-3 is 26 feet from remote to camera. Say you’re photographing a young child and want her to see your funny expressions so she’ll laugh. Place the camera on a tripod and use a cable release like the MC-30A to trip the shutter. Another instance when you might be setting a camera up on a tripod, is in Astrophotography (photographing the night sky). One of the more popular types of Astrophotography is the shooting of time-lapse movies of the stars traveling across the sky. Oftentimes, this is done from sunset to sunrise, showing the vibrant colors of sunset, fading into the dark sky and back to vibrant sunrise again. Newer Nikon DSLRs and the Z system Mirrorless cameras have a built-in Interval Timer which is used to snap images in an orderly manner, every few seconds or so, for however long you want the exposure to be, depending upon the look you’re going for. In this case, you’ll want to use a simple cable release to trip the camera. Using the cable release means there’s less of a chance of camera shake from your pressing the shutter button. For cameras that utilize the accessory terminal, the MC-DC2 provides you with a cabled remote firing solution, and it features a lockable shutter release that’s used when shooting in Bulb mode. If you’re using an camera with a 10-pin connector, you can use the MC-36A remote cord, which incorporates an Interval Timer into its features. For a photojournalist who’s capturing an important occasion that can’t be repeated, such as the presidential inauguration, you’ll likely be using multiple cameras that have to be set up beforehand, and tripped off during the event—and its likely you won’t be so close to the cameras either. 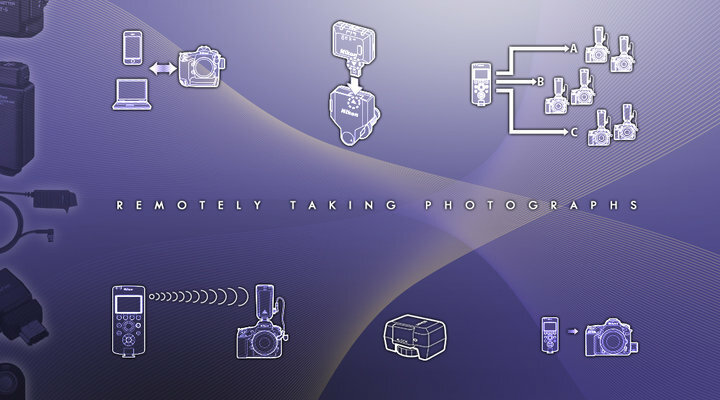 In this instance, the Wireless Remote Controllers (such as the WR-R10 transceiver that’s placed on the camera (the WR-R10 uses an accessory port connector, so if you’re using one of the higher-end DSLRs that instead use the 10-pin connector, you’d also need the WR-A10 Adapter) you’d use and receives the signal from the WR-T10 Wireless Remote Controller transmitter) would be the way to go. Or you could use multiple WR-1 Wireless Remote Controllers. (These units are both transmitter and transceiver in one). Because this system uses radio frequencies instead of Infrared, you aren’t limited to the transmitter being in the line of site of the transceiver. The range on this system is also much greater than the line of sight options. The range of the WR-T10 to WR-R10/WR-R10+WR-A10 is 66 feet. The range of one WR-R10 used as a transmitter to another WR-R10 used as a transceiver is 164 feet. The range of a WR-1 to another WR-1 is 394 feet. There’s another option for today’s connected photographers who want to be able to share their images on the web from the moment the shots are captured. Using a Nikon camera that is compatible with the WU-1a or WU-1b Wireless Mobile Adapters, you can set the camera on a tripod or sturdy surface, leisurely get into the shot, and use your Apple iPhone®, iPad® or iPod touch®, or smartphone or tablet running on the Android™ system (using the appropriate Nikon Wireless Mobile Utility App.) to snap the shot, upload the images to your smart device and quickly share on the web or via email. You could also use the Wireless option to set up your camera to shoot timid creatures in a nature setting. When you see your shy subject nearing the frame, get ready—and then snap the shot. For the pro photographer shooting studio portraits or commercial images, who needs to send images from the camera to a computer or FTP server for viewing by an art director or client on a monitor, you could use one of the Nikon wireless transmitters such as the WT-7A, WT-6A, WT-5A or WT-4A (depending upon which transmitter your camera uses). For folks using the D810, D800/D800E, D7000, or D7100 DSLRs, the UT-1 will provide you with an Ethernet connection going from the camera to a computer or FTP server. In PC Mode, you can even shoot from the laptop so long as it is running Camera Control Pro 2 software. For those same cameras, the UT-1 + WT-5A will provide a wireless connection to a computer or FTP server. The D5200 is shown here with the WR-R10 wireless remote controller attached. The WR-R10 is a transceiver. The WR-T10 transmitter sends signals to the receiver to operate the camera wirelessly. The D4 body is shown here with the WT-5A wireless transmitter attached. Underneath the WT-5A, you can see the open door showing where an Ethernet cable would be plugged in for a wired connection. The UT-1 communications unit provides a wired Ethernet connection for the D800 and select other Nikon D-SLRs, to communicate with a computer or FTP server. When combined with the WT-5A, the UT-1 provides a wireless connection between the camera and a computer or FTP server. The WR-1 wireless remote controller is shown here connected to the D7100 using the MC-38 connecting cord. The WR-1 and camera are sitting on the Nikon SK-7 bracket for flexibility in handling. The D5200 can also utilize the WU-1a wireless mobile adapter which, when used with the free Mobile Utility app, allows you to shoot with the D5200 and download images to your smartphone or tablet. The WU-1b is also compatible with select Nikon 1 series interchangeble lens digital cameras including the Nikon 1 J3. When used with the free wireless mobile utility and a compatible smartphone or tablet, images can be shot and downloaded to the smart device. Can my Nikon 1 or COOLPIX go wireless too? Nikon DSLRs, Z System Mirrorless camera and select Nikon 1 and COOLPIX camera users can also utilize some of these same ways of wirelessly taking photographs. Most of these cameras have a self-timer built-in. By placing your camera on a tripod or stable surface, and setting the self-timer, you can get into your shot. Select models of Nikon 1 advanced interchangeable lens digital cameras as well as certain COOLPIX compact digital cameras can utilize the ML-L3 wireless remote control, which uses an Infrared signal to tell the camera to snap a picture. You can be up to 16 feet away from the camera, however you will need to be in ‘line of sight,’ so the camera and ML-L3 can communicate via the Infrared signal. Digital camera models such as select DSLR, Nikon 1 and COOLPIX models are compatible with the WU-1a or WU-1b, wireless mobile adapters. Nikon’s Mobile Utility app for lets you use your iPhone, iPad, iPod touch or smartphone or tablet running on the Android system to shoot and download images from the camera. Even newer cameras including DSLR and Z System Mirrorless as well as COOLPIX cameras have Wi-Fi built-in and can be controlled via the SnapBridge app on your compatible smartphone or tablet. Check your camera's User's Manual to see which options your camera offers. For a list of Nikon remotes and releases; and the compatible Nikon Z Mirrorless, DSLR, COOLPIX & Nikon 1 digital cameras, download the Nikon Remotes Compatibility Chart PDF.